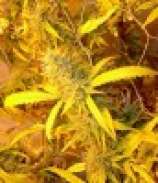 Here you can find a strain description about BC Big Bud and also some user-based reviews and infos directly from the SeedFinder (if available). You can also find the offers and auctions here if BC Big Bud cannabis seeds are on stock at MyCannapot right now. The resin production is outstanding, making crystal gems of the buds, and carpeting the leaves with dew drops. Even Big Bud's seeds are large, although seed size does not necessarily correspond to eventual plant or bud outcome. This variety can be grown indoors or out, but due to large solid buds, care should be taken to avoid overmoisture as this could encourage mold. Indoors, it is happy in a hydroponic setup and can be used in a sea of green method, or allowed to grow large with multiple branching. BC Big Bud is not available at our shop at the moment!